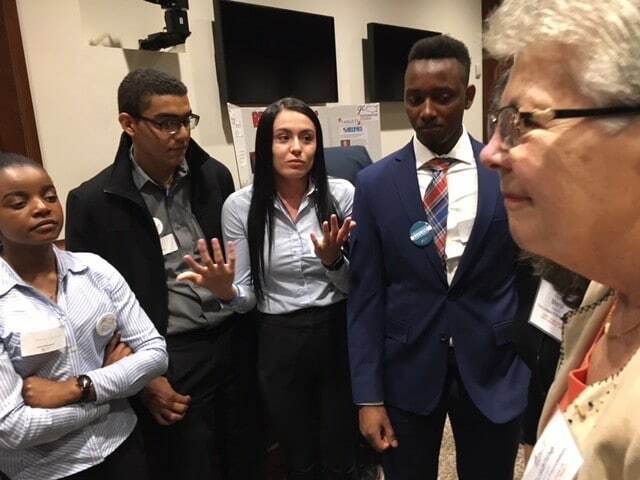 Suzanne Beaton, a volunteer judge, listens to Lowell High School students present their action plan at Civics Day in Boston. I got charged up chanting these words alongside people of all ages a few months ago at the March For Our Lives. Throughout my life I have marched for social change — including the hope for a future free from the fear of gun violence. But this time, I had another motivation. I wanted to support the young people who rallied the nation after the school shooting at Marjory Stoneman Douglas High School.